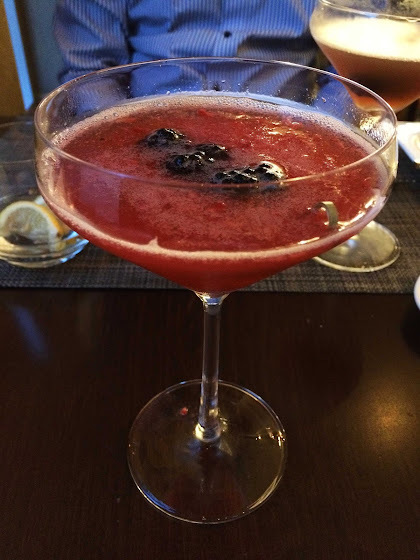 It’s high time I raved about Habitat Restaurant at the Fairmont hotel in downtown Pittsburgh. This remains my favorite restaurant in the flourishing Pittsburgh dining scene and a locale that never fails to impress. 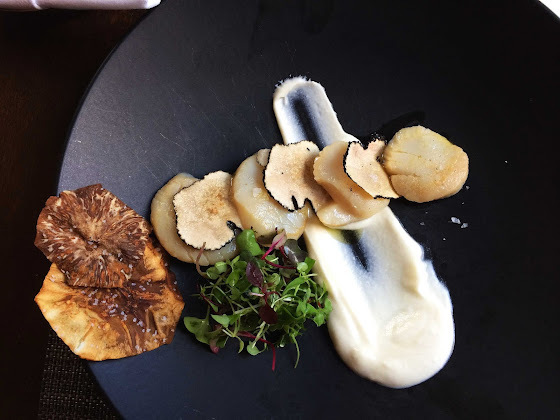 Tucked inside the Fairmont Hotel, Habitat Restaurant is easily stereotyped as an overpriced and average venue due to its prime location and the fact that it belongs to a hotel. But that cannot be further from the truth. With a modern décor and an open high-class professional kitchen, Habitat provides a traditional, non-intrusive and overall truly impeccable service while highlighting a vibrant, cutting-edge, seasonal cuisine for breakfast, lunch, brunch and dinner. 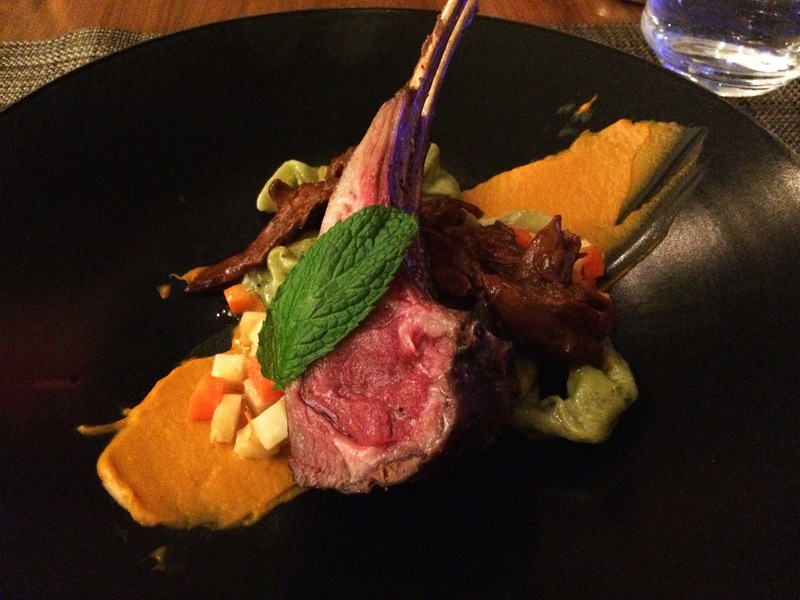 Although the food encompasses subtle international flavors, the main focus remains the new American cuisine while also showcasing the quality and freshness of local ingredients. In fact, the Chef doctors the flavors based on season and availability of locally sourced ingredients; the only thing brought from more than a hundred miles away is the wine. The food menu is not the only thing that changes periodically; the dessert and drink menus have a similar fate. That being said, a few favorites are available year-round on the main menu. 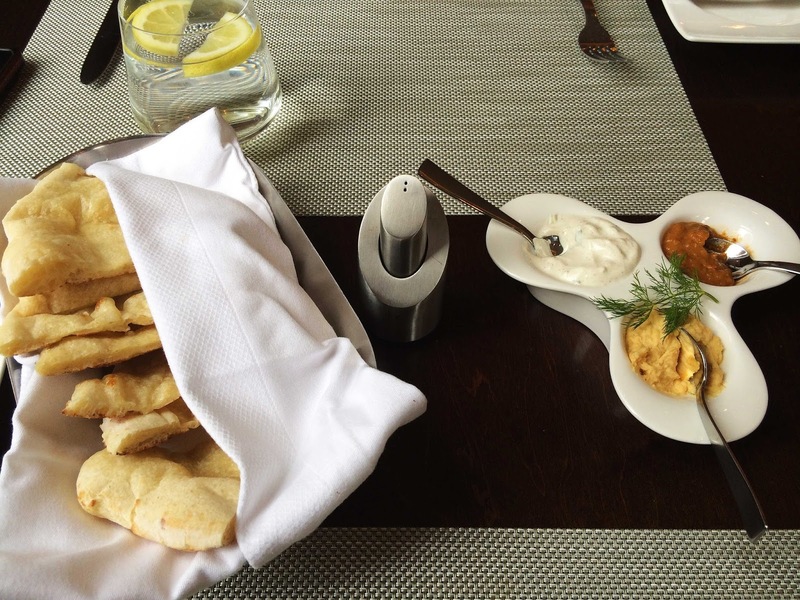 One of them is the Fresh tandoor baked naan bread, which is an indisputable crowd pleaser. The warm, pillowy bread squares served with a trio of homemade spreads make for a light and tasty appetizer. Being an avid beet eater, I always opt for the Roasted organic local beets – my ultimate beets salad and a constant on the menu. 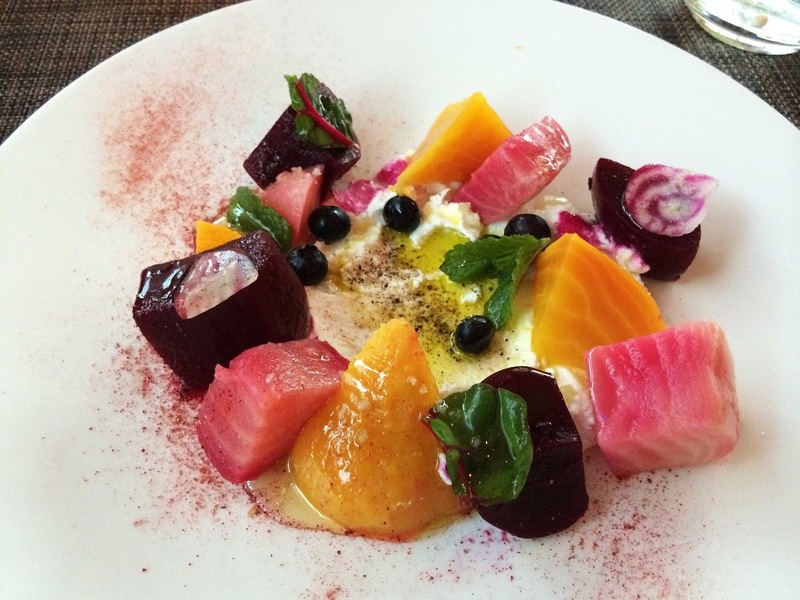 The colorful beets are roasted and pickled and they contrast beautifully against the creamy and tangy goat cheese and sweet wild flower honey. I can’t rave enough about this salad and the bold, well balanced flavors that make this starter something I can easily indulge in all day, every day. Another dish worth the money is the Burrata and faro appetizer. There’s nothing better than creamy yet al dente faro topped with oozing, smooth burrata cheese. This is an excellent choice when available and a generous enough portion to split. 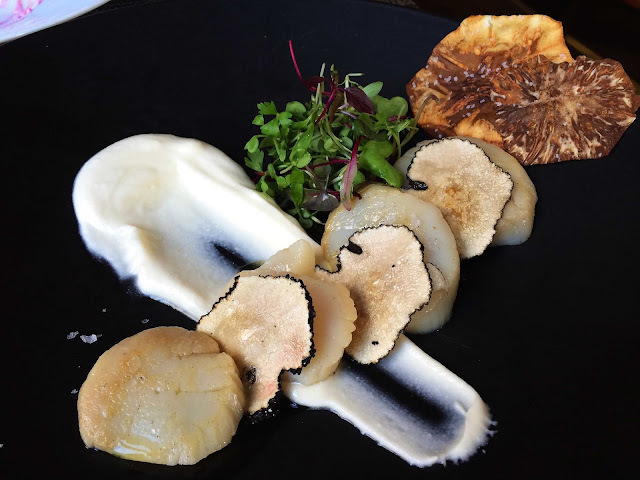 The Scallops and truffles crudo piled on a smear of velvety parsnip puree is another lovely option especially in summertime. The sweet, meaty scallops are nicely paired with earthy truffles to make a beautiful and refined dish. 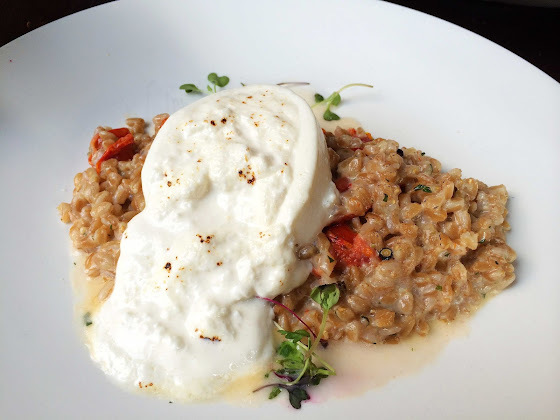 In wintertime, you can’t go wrong with the Risotto and pork belly starter. 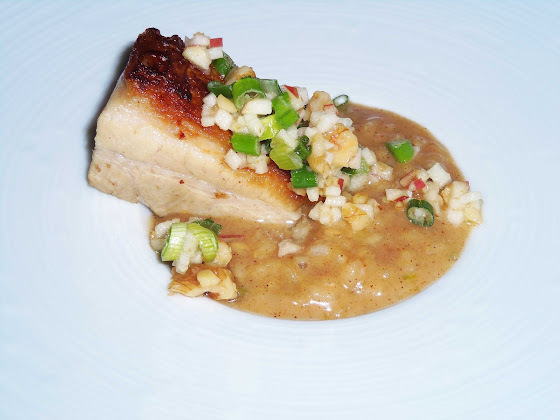 The buttery risotto enhances the heartiness of the pork belly, while the acidic apples and crunchy scallions cut through the richness of this decadent dish. The Smoked duck breast is another favorite of mine. This main dish varies on a regular basis showcasing seasonal ingredients and flavors. 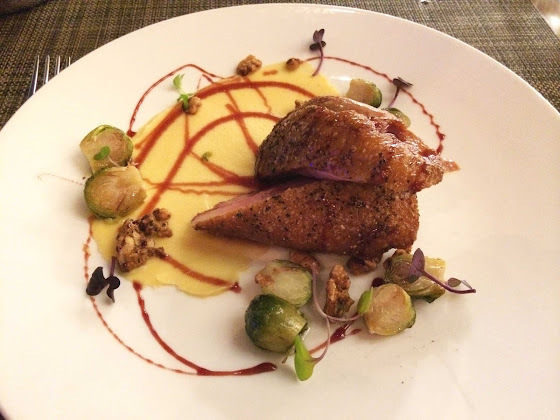 This time around the duck breast is really well seasoned and perfectly mid-rare complemented by an assertive maple roasted rutabaga puree and port reduction, roasted Brussels sprouts, and finished with nutty candied walnuts for a bonus crunch. Adrian on the other hand prefers the Lamb chops entrée. Here, the braised lamb is the star of the dish; moist, tender and flavor-packed. The mint pesto pappardelle are the perfect accompaniment, light yet rich making for a truly winter meal. Add to that a pungent but not overwhelming sauce and some root vegetables and you have a symphony of flavors packed into a balanced and nuanced main dish. 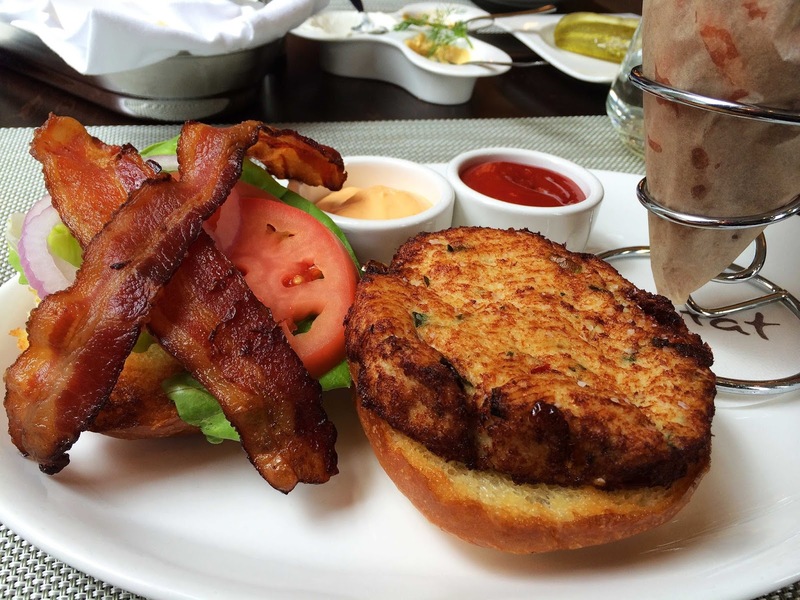 Another beloved option that I simply can’t ignore is the Crab cake BLT. The thick patty of deliciously sweet crab and the tasty chili lime aioli are front and center, while the Applewood smoked bacon, crisp lettuce, red onion and tomato are the understated garnishes stacked on a pleasantly toasted bun. And let’s not forget about the mouthwatering side of sweet potato fries that round up this spectacle of flavors. Although you’ll find this burger on the lunch menu, more often than not the kitchen will be nice enough to fix this dish for you at dinnertime. Furthermore, pairing the burger with soup at lunchtime is a popular choice. 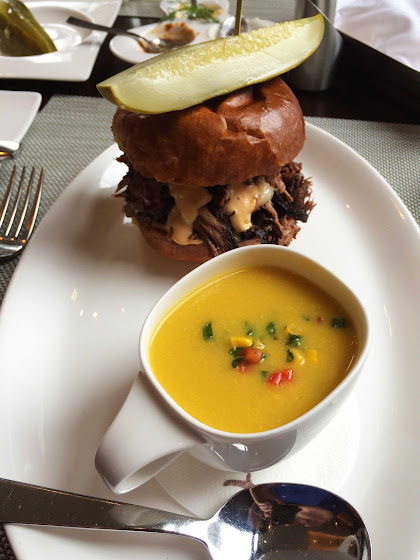 Here, I opted for an amazing seasonal corn soup and the House smoked beef brisket with pickle aioli on a farmhouse roll. The ultimate combo! 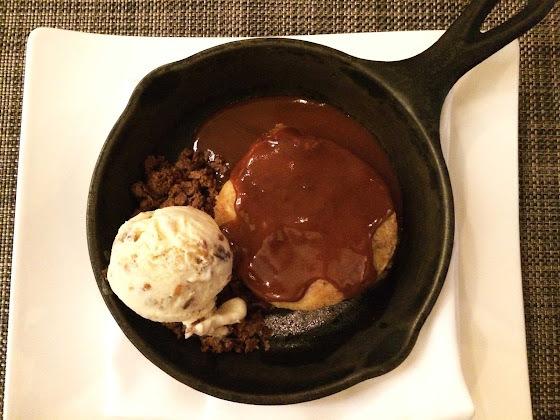 Regardless of how satiated we feel after dinner, we can’t skip a sweet treat. The desserts at Habitat are innovative and creative, combining unique, compelling flavors and artful presentations and, similar to the drinks and main menus, they change regularly. Right now, an excellent option is the Monkeying Around – a warm croissant banana pudding paired with rum raisin ice cream, a chocolate walnut crunch and drizzled with chocolate banana fondue. Warm, rich and simply phenomenal! 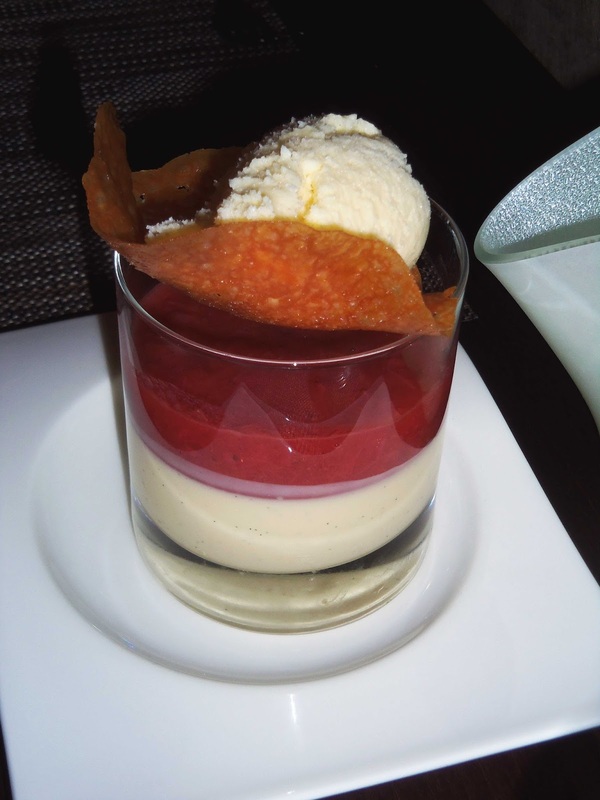 In the spring and summer, I gravitate towards the Essence of Spring dessert, which is sweet and fruity, custardy and crunchy, and topped with ice cream. Yum! I already look forward to ordering that again soon. 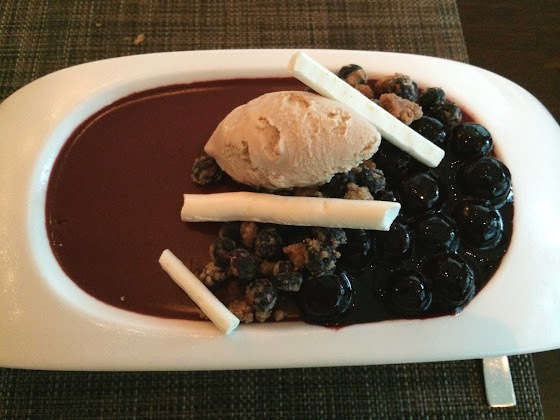 Another great choice is the Blueberry Panna Cotta, which I can’t get enough of and wish it were a constant on the menu. Overall, Habitat Restaurant always aims for consistency, is the perfect blend of splendid food and exceptional service, and is a restaurant that we return to time and again! And if you find yourself stranded in Pittsburgh over the holidays or simply decide to forgo the Christmas cooking, make sure to book a place at their Christmas Brunch this Friday, and don’t forget to inquire about their New Year’s Eve menu and availability. Adrian and I reserved a table for New Year’s Eve last year and it turned out to be a brilliant and delicious decision. We would have done the same thing this year but this December we’ll be in Romania for the holidays, something that we’re so excited about. So, without further ado, I wish you all a wonderful and happy holiday season and a blessed New Year!